Imagine thousands of people stampeding toward residence halls—eager students anxious to begin a new semester, emotional parents who are not quite ready to say good-bye, and siblings plotting room takeovers. 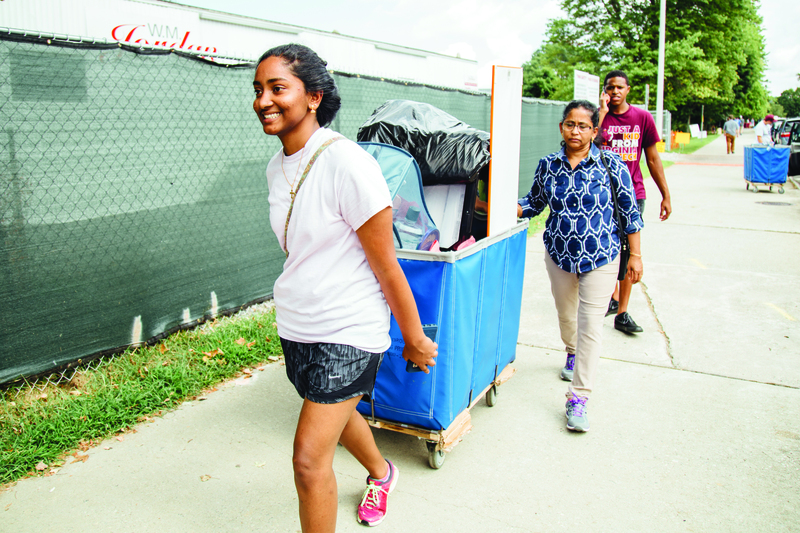 That’s move-in at Virginia Tech. 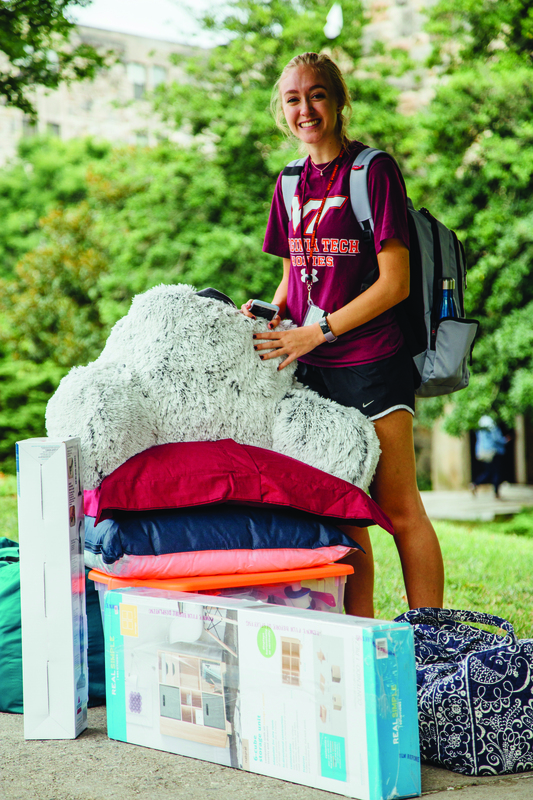 Long before the first acceptance letter is mailed, before Hokie dreams become reality, Virginia Tech is working behind-the-scenes to ensure that the transition from home to campus is as stress-free as possible. Jean Smoot, project coordinator for housing services, records feedback from the 2016 move-in. Housing and Residence Life updates websites, begins drumming up volunteers, and reviews the budget. A new order for Hokie Helper shirts is placed. The shirts are blue (as are tents and other equipment used during move-in) so that they stand out in the sea of maroon and orange. Each shirt has a white name patch, an innovation suggested by a frustrated student who kept losing name tags. Staff coordinate campus communication. The Virginia Department of Transportation makes plans to minimize construction delays on I-81 and U.S. 460. Corps of Cadets “black shirts” set up tents in six central zones. Special projects team delivers tables, bins, and carts. Water arrives from the dining warehouses. The Division of Student Affairs summer conference crew transports snacks, Hokie Helper t-shirts, and other materials. A small tub with maps, registration notebooks, pens, scissors, trash bags, signage, and more is delivered to tents. Virginia Tech police close Washington Street. 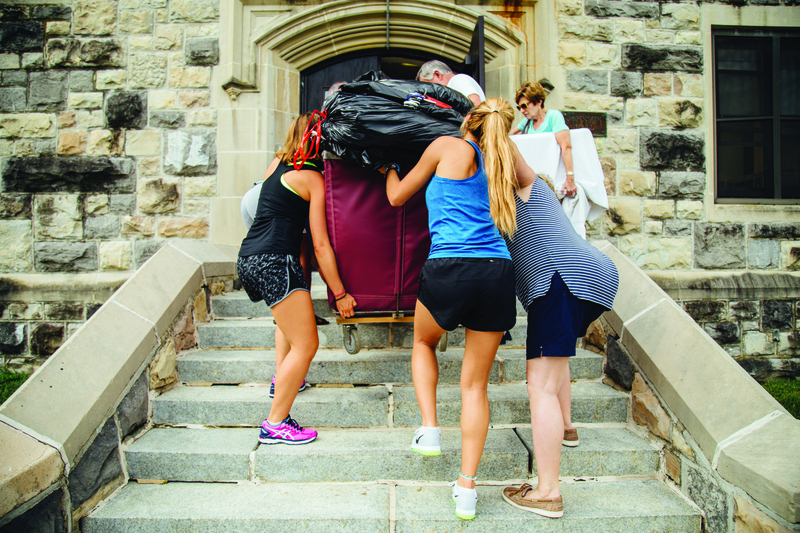 Helping hands: President Tim Sands and Professor Laura Sands help a student move items into her new residence hall. Vehicles packed with computers, clothes, fans, potted plants, books, full-length mirrors, lava lamps, game systems, refrigerators, microwaves—oh, and students and their families—line up. Traffic on U.S. 460 at Southgate is backed up a mile, but the line is moving. Police officers and parking services employees keep traffic flowing to parking spots. The aim is to open this space again within 30 minutes. 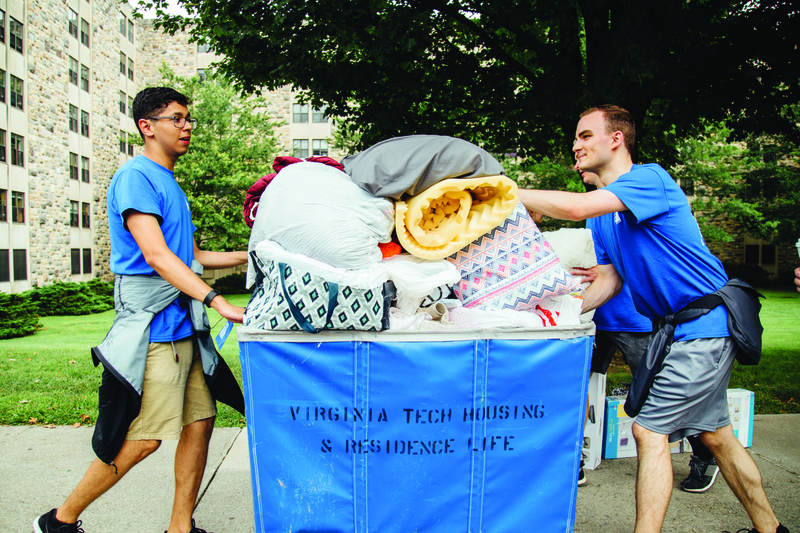 Hokie Helpers assist in getting belongings out of vehicles and up to rooms. Doors that automatically lock are opened by volunteers, and custodians help keep elevators moving. There’s a line for the highly coveted laundry bins and Hokie Helpers, but the mood is jovial. Strangers introduce themselves while they wait. Facilities department subcontractors set up extra trash containers and cardboard collection sites and ramp up collection schedules, moving out three times the normal weekly amount of refuse. Highway traffic is monitored for tie-ups in case resident advisors are needed to stay past 5 p.m. to check in late arrivals.